Just finding one or two bottles here and there throughout the year really adds up. In 2017, it meant that 22 bottles of Volvic water, and its associated Touch of Fruit, were found. Over the course of the year, approximately 8% of the recycling found was some type of water but, as a whole, water bottles tend to be an underrepresented category because they lose their labels quite quickly. This week be on the look out for Dr Pepper. 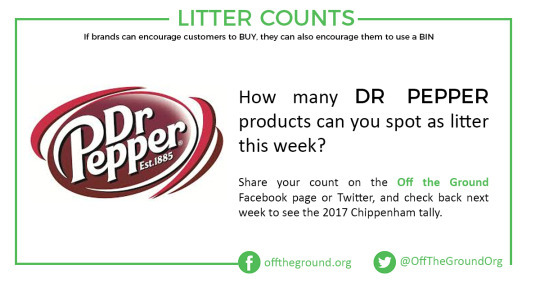 Although it’s not very common compared to the other soft drink brands (Chippenham is definitely a Coca-Cola town), we do find Dr Pepper on occasion and it is one of the brands that makes the carbonated beverage category one of the most highly littered.